I came across the writing of indie director Alex Cox about a year ago in Film Comment magazine, where he writes a regular column. I’d only seen a couple of his films and had no real idea of what his filmmaking principles were, so to speak. But reading his writing about what films he liked made me want to know more about him. He is also a fine writer, so I knew reading a full-length book from him would be a pleasure, no matter what the topic. But another event occurred recently that made me want to read this even more. 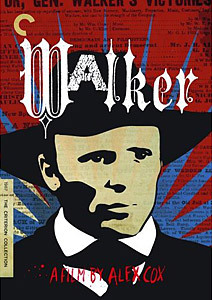 In early 2008, Criterion released his film Walker in a packed special edition DVD. Though I’ve still not seen it, this project fascinated me for many years. Made in Nicaragua with the full support of the Sandinista government in 1987, Walker was about an American who, in 1855, invaded Nicaragua with the intention of annexing it for the US. Considering the political climate of the time, with American-backed “contras” trying to overthrow the Sandinistas, Walker was never going to be a commercial success. But something about Cox’s steadfast and sometimes quixotic support of left-wing causes made us kindred spirits and so it was always on my list of films to see. Today, an independent filmmaker is a revolutionary fighter, in a prolonged popular war. This is the same war that Free Software and GNU/Linux activists fight against Microsoft; that the Slow Food movement fights against McDonald’s; that independent musicians fight against the RIAA (Recording Industry Association of America) and the Apple Music Store; that Fairtrade activists fight against WalMart and the WTO; that the Zapatistas fight against patriarchal systems of control in Mexico. There are no spoils to be had on this battlefield, and no prospect of a quick and easy victory. Yet, buoyed by belief, and by the lack of a sustainable or sane alternative, the guerrilla soldiers on. In the case of feature films, the battle for an independent, personal art form is already won (thanks to the Mini DV tape and the DVD), lost (thanks to the studios and their admirers), but irrelevant anyway. Irrelevant because the feature film was the original art form of the twentieth century. It can’t be the original art form of the twenty-first as well. Something that goes beyond it will displace it—some medium equally visual and visceral, but interactive, with multiple narrative possibilities. It’s already being born: out in the same uncharted territory as the computer game, the “readjusted” corporate web site, and the home-made CD of “illegal” MP3s. But the birth won’t be easy, and the new form is destined for a long and hard-fought war. It’s not all quite that provocative, but I like where he’s coming from. And in his anecdotes from a lifetime making films, you can see how he’s come to embrace the new technologies while continuing to believe in the power of a good story. 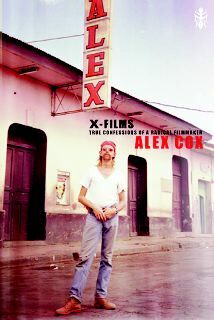 Liverpool-born Alex Cox‘s directorial credits include Repo Man, Sid and Nancy, and Walker. He also wrote the script for Terry Gilliam’s Fear and Loathing in Las Vegas, and has acted in many of his own and other directors’ films. If you buy from Amazon using this or the above links, you’ll help support Toronto Screen Shots. This entry was posted in Books, Directors and tagged alexcox. Bookmark the permalink.